The rear of a 1970 Volvo 145 was carpeted and offered up 70 cubic feet of cargo space.. If there was ever a European passenger car ideally suited to our harsh climatic conditions, it would have to be Volvo. Unlike automobiles that can trace their origins back to carriage makers or bicycle manufacturers, the Swedish auto draws its heritage from a ball bearing company. The automobile was first thought of in 1924 but it took three years for engineers to get everything to be like baby bear's porridge-- “just right.” Volvo bowed to the public in 1927, its name being Latin for “I roll” or “I turn.” Volvo was a solid product and satisfied the Swedish and Scandinavian markets. 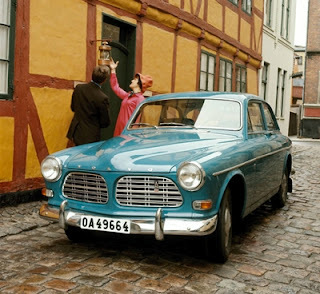 Because Sweden was neutral during World War Two, Volvo built passenger cars throughout the war years—though the vehicles did run on steam and carry their own boilers. Volvo first appeared on our shores in 1959. By 1961 the sturdy little cars were finding 2,000 owners or so a year throughout the Dominion. 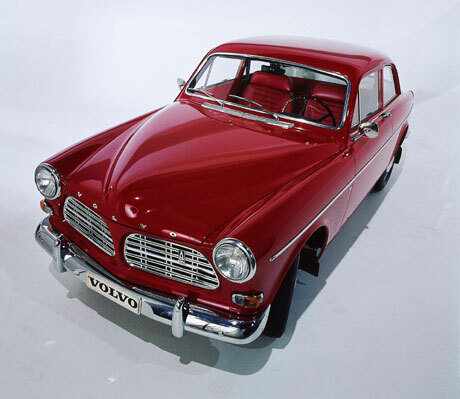 When it came time to expand, Volvo chose Canada for its first new home outside of Sweden. The company’s requirements were complex. A factory needed to be on a deep-water port for easy and quick delivery of parts from Sweden as well as the possibility of shipping completed cars to other countries. The site needed excellent road and rail links to the rest of Canada. After careful study, a 1.6-hectare site in Dartmouth, Nova Scotia was chosen. A building stood on the shoreline property already; a previous factory had refined sugar. The deal for the property was signed with Atlantic Estates Limited in 1963 and records show that Volvos began rolling (yes, the pun is intended) out the doors in September 1964. The first products were the P120, P130 and the P220 models. These were known throughout much of the world as the Amazon. Here at home they were called Canadian. The domestic production tally was 1,139 units for the 1964 model year. The Volvo is seen in its natural habitat: snow and cold. The Canadian was rugged and owners loved them. Domestic model year output for 1965 was 2,870 units. A year later workers assembled 3,458 units in Dartmouth and topped that figure in 1967 with 3,993 units produced. 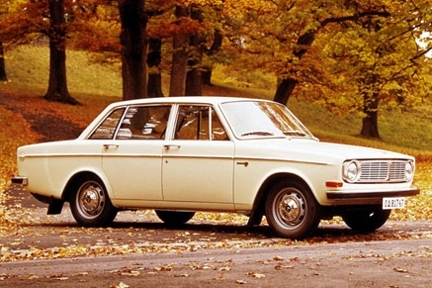 The 1968 Volvo 140 series appealed to practical Canadians. As more and more Canadians discovered Volvo, domestic 1968 model year production reached 4,760 units. It didn’t hurt any that Volvo introduced an updated series of automobiles, either. 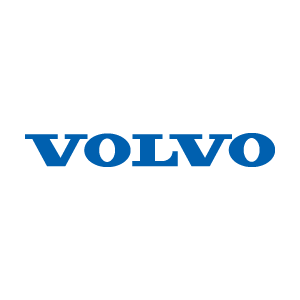 After five years of increased production, the number of Volvo passenger cars built during the 1969 model year dropped to 3,030 units. 1970 was the last year for the Volvo Amazon. The dependable 140 series was returned for the third year and was virtually unchanged for the 1970 season. The unit-body was solid with more than 8,000 weld points. One could stack ten Volvos on top of each other and they would hold their own weight. When cars did fall into the ocean while being loaded, Volvo turned the disaster into a publicity stunt by doing exactly that. As a firm believer in improvement only for the sake of improvement, there was nothing for Volvo to do but build more cars. There was so little to talk about that the corporate headline was, “This year it has two new colours.” Advertising also boasted that nine out of ten Volvos registered in Canada since 1959 were still registered and running the roads. The Volvo 140 series definitely did not follow the fashion dictates of the time—a long hood and short rear deck—making the car from Sweden stand out in any parking lot. 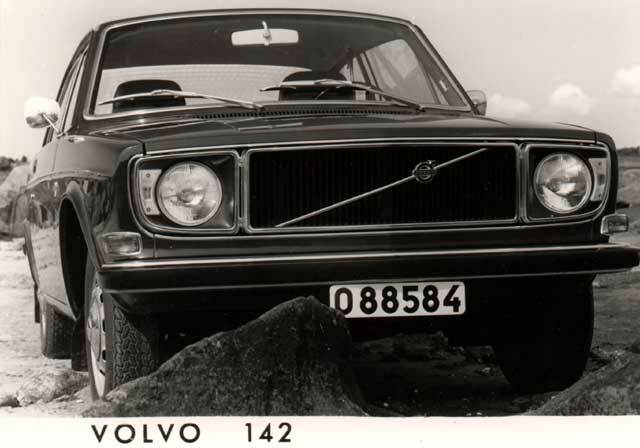 Volvo made use of three-digit numbers to identify models. The “4” stood for four-cylinders and the final digit told how many doors the vehicle had. 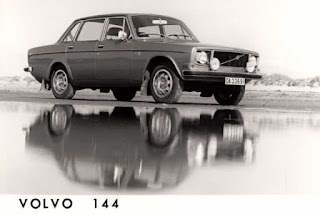 Hence, 142 was the designation for the two-door sedan, 144 was the no-nonsense moniker for the four-door sedan and 145 was given to the station wagon. The 1970 Volvo 142 weighed in at 1 161 kilos (2.560 pounds) and had a 1 348-millimetre (53.1-inch) 1 161 track, front and rear. It could be had for $3,888 or $85 a month in car payments. 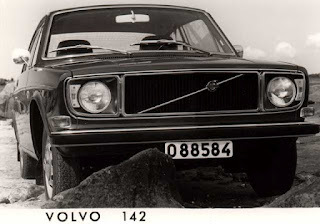 Under the hood of all the cars in the 140 series was Volvo’s powerful 2-litre, 118-horsepower four-cylinder, five-main bearing engine judged to be “unbreakable.” A four-speed, manual floor shift was the norm but half of all orders were for the extra-cost automatic transmission. Interiors were surprisingly large and comfortable. One could actually fit three passengers in the rear seat. The upholstery was a “miracle fabric we call ‘cloth’. Not cotton or wool but a tightly woven synthetic. It breathes.” Front seats boasted a lumbar control for additional back comfort. The 145 promised that it was different from others of its ilk. 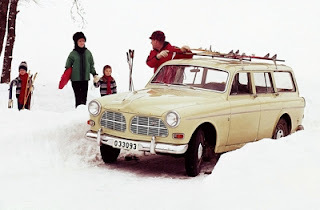 “Most station wagons are either of two things, a car that rides like a truck when it’s full or a car that rides like a truck when it’s empty.” Volvo pledged to be a station wagon that did not have the disadvantages of a station wagon. 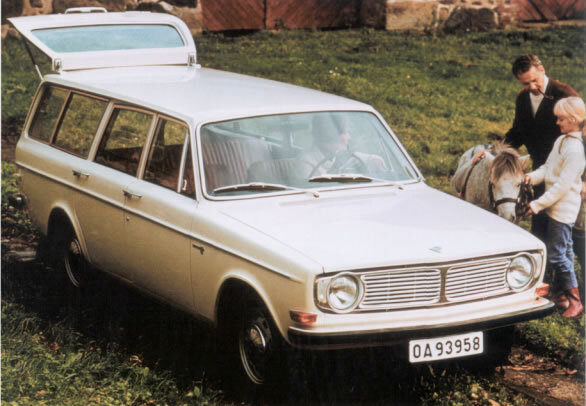 With 70 cubic feet of room in the cargo area, the Volvo wagon was every bit as luxurious and comfortable to ride in as a Volvo sedan. 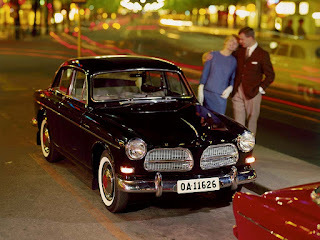 Further, Volvo offered an electric rear window wiper and an electric washer on the back window as standard equipment. Ad copy said, “Never seen one before? If you’ve owned a wagon, you’ve often wished you had!” The idea was not new, Nash had offered a rear window wiper on passenger cars in 1950 but the convenience was greatly appreciated. In keeping with owners’ desires Volvo’s electric rear window defogger was moved from the accessories list to standard equipment, too. 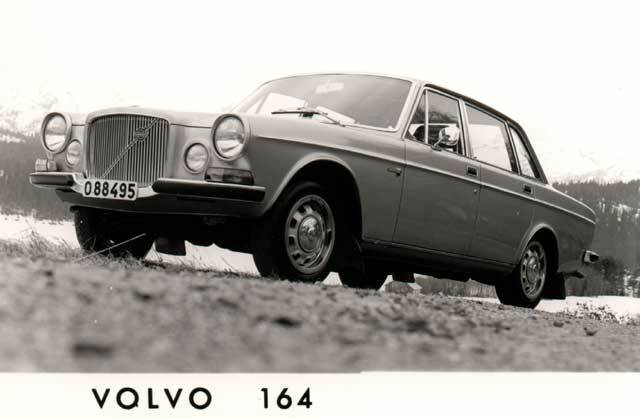 The posh top-of-the-line Volvo 164 series rounded out the marque. The 1970 model year production hit an all-time high of 7,730 units. Though no one knew it at the time, workers at the Volvo plant in Dartmouth would come within a cod fish kiss of cracking the 10,000 mark in 1971.